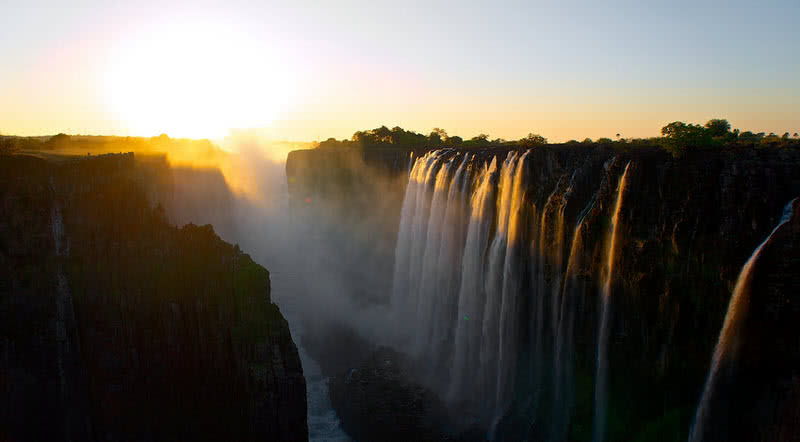 The 355 foot tall, one-mile-wide Victoria Falls is one of the largest waterfalls in the world. It creates the biggest curtain of falling water with a flow rate of 550000 cubic meters per minute. The spectacular Victoria falls one of the seven natural wonders in the world. The local people called this waterfall ‘Mosi-o-Tunya’ which means ‘The smoke that thunders.’ The mist created by this Victoria Falls saw only from a distance of 50 kilometers. Due to the high spraying of Victoria falls, the River Zambezi rainforest receives 24*7 rainfall. There is a natural pool at the edge of the Victoria falls called the ‘Devil’s pool.’ In the dry season, you can safely swim in this pool. The natural rock wall at the edge of the waterfall will defend you from being swept down. You can see the rainbow over Victoria falls even at night. This phenomenon is known as ‘Moonbow.’ It formed by the reflection of Moonlight on the mist created by the waterfall. It is a beautiful canal village in Overijssel province of Netherlands. This village is nicknamed as the ‘Venice of the Netherlands’ Because canals separate the lands of Giethoorn and linked by the bridges. De Weerribben-Wieden National Park surrounds the village. 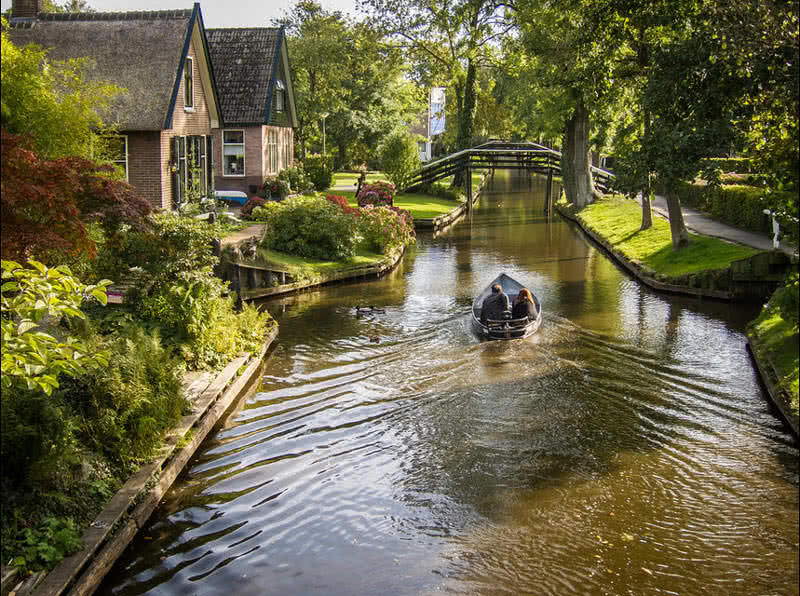 Thus, Giethoorn is also one of the greenest places in the world. Giethoorn is a car-free place. Boating and cycling are the only way to get around the village. There is noise-free electric boat service to explore the Giethoorn. The French capital, Paris is truly a great city of art, culture, history, architecture, and fashion. 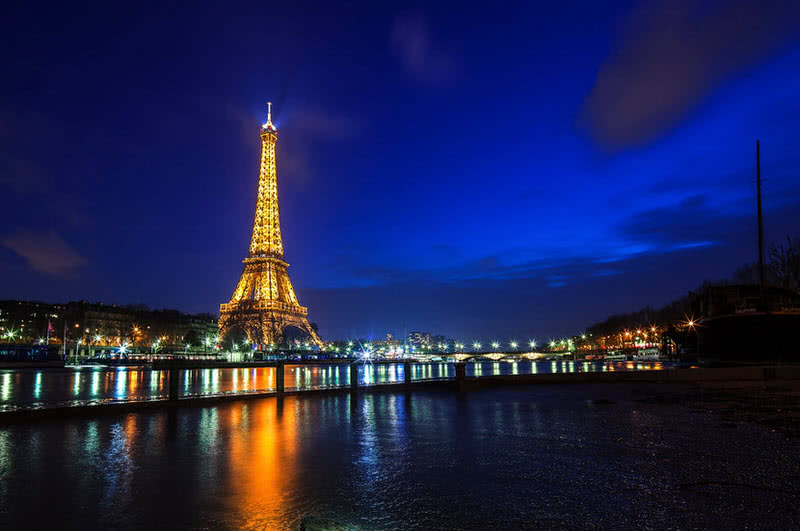 Paris is also called the ‘City of lights’ because it is one of the first cities to adopt street lighting. The Eiffel tower itself is the most famous attraction of Paris. It is one of the most iconic constructions in the world. Built by Gustave Eiffel in 1889. Until 1930, the Eiffel tower was the tallest building in the world. You can reach the top of this tower using either the lifts or the stairs. Home to many world-renowned museums including The Louvre, Musee d’Orsay, Petit Palais, and Rodin museum. Among them, The Louvre is the most famous museum in Paris. It has a huge collection of artworks from famous artists. Da Vinci’s world-famous work ‘Mona Lisa’ has been on display at this museum since 1797. You can enjoy the music and theatre performances at its best in Paris. Visit the fantastic Palais Garnier opera in Paris. It presents you great performances of ballets and operas. The Notre Dame Cathedral is a don’t miss attraction in Paris. With the looming ceilings and beautiful sculptures, Notre Dame Cathedral is one of the most beautiful church buildings in the world. This ancient, Catholic cathedral is also a great example of French Gothic architecture. Arc De Triomphe is among the most impressive human-made arches in the world. Its construction was ordered by the French emperor Napoleon Bonaparte in 1806, to honor the French army of that time. The name of all French victories and name of 558 generals have inscribed on the top this great monument. Petra is an impressive ancient city located between the Dead Sea and the Red Sea in the Southern Jordan. It is one of the most important archaeological sites in the world. The Greek word ‘Petra’ means ‘Rock’ in English as the name indicate this ancient carved on a sandstone mountain. Petra is also known as ‘rose city’ because of the red-rose color of the mountain. The Petra was built early as 5th Century B.C by the Nabataean. UNESCO recognized this site as a world heritage site in 1985. The city is an outstanding example of rock-cut architecture. 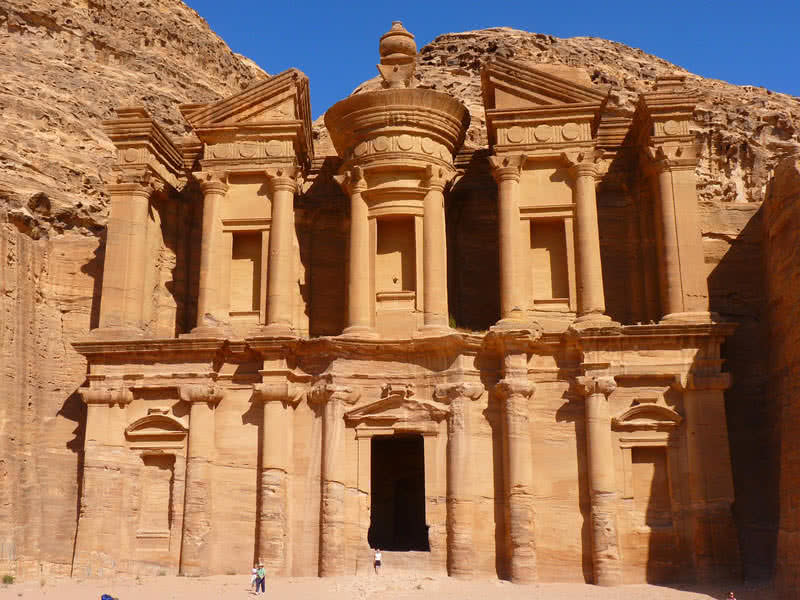 There are 800 monuments in Petra including temples, tombs, and altars. The highly decorated royal tombs are the main attraction of this site. The most beautiful valley in North America, located in the Yosemite National Park of Northern California. Yosemite Valley is 7 miles long and 1 mile wide. 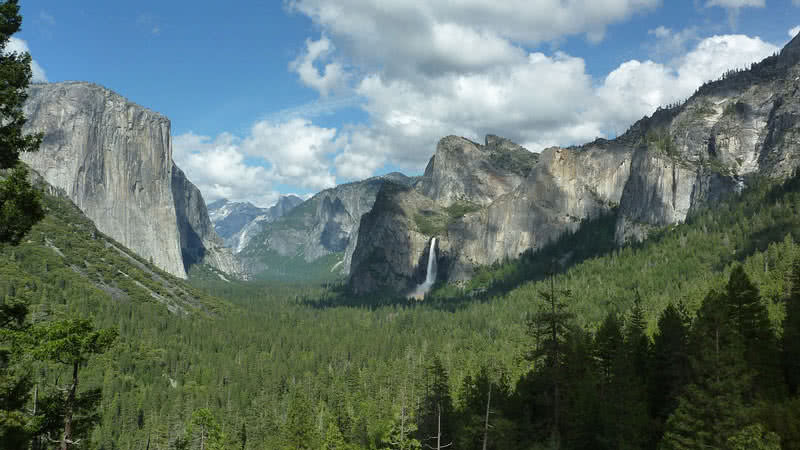 The famous EI Capitan, Half Dome, Yosemite Falls, Vernal Falls, and Nevada falls are located within this valley. The 2425 foot tall Yosemite fall is the tallest waterfall in North America. Apart from the spectacular cliffs and waterfalls, Yosemite Valley is also home to abundant wildlife. Walking is the best way to explore the Yosemite Valley. There is also well-maintained bike paths. The tunnel viewpoint on State Route 41 is the best spot to enjoy the stunning view of the Yosemite Valley. Stonehenge is an elaborate prehistoric monument located in the Salisbury city of England. It consists of a ring of standing stones. The impressive Stonehenge monument is one of the seven wonders of the ancient world. There is no clear explanation about the creators and purpose behind this amazing stone monument. It is believed to be the Stonehenge was built between 3000 B.C and 2000 B.C. It is said to be the construction of Stonehenge took more than 30 million hours of labor. The Stonehenge aligned with midwinter sunset and midsummer sunset. 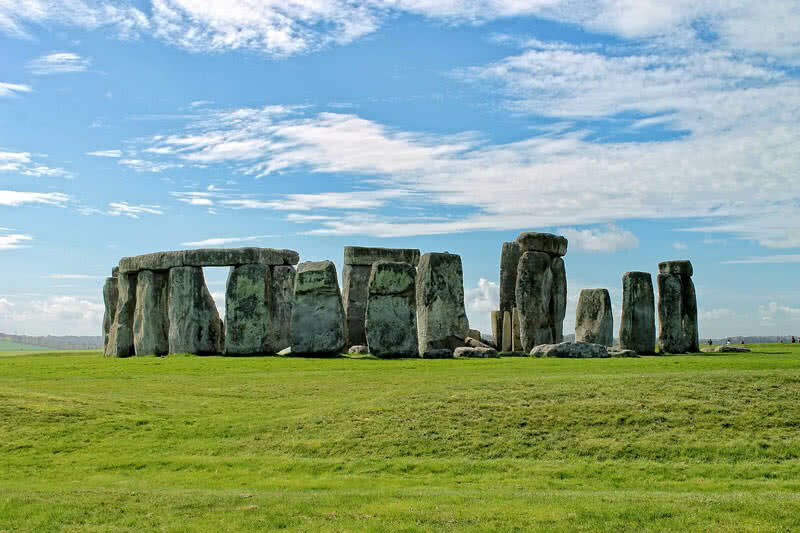 There are two types of stone used of the construction of Stonehenge – sarsen stones and blue stones. The blue stones weigh between 20 and 25 tones, and sarsen stones weigh up to 4 tonnes. Surprisingly, these huge stones were brought from 240 miles away from places. Still, nobody knows how the Ancestors succeed in such an impossible task. Established back in 1872 the Yellowstone National Park is the first National Park in the world. The majority of the park lies within the State of Wyoming. It also extends to the range of Montana and Idaho. Yellowstone National Park covers a vast area of 3468 square miles. The 80% land of this park forested. 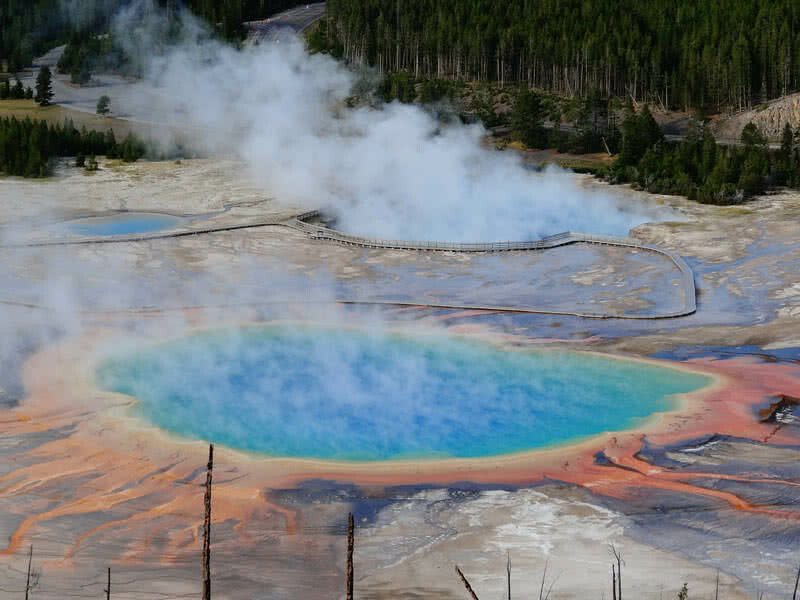 Yellowstone National park has more than 10000 thermal features and over 300 geysers. The grand prismatic spring of Yellowstone National Park is the largest hot spring in the United States. Every minute this hot spring discharges 2100 liters of hot water. At the edges, you can see vivid colors of red, orange, yellow and green. This coloration is due to the action by the cyanobacteria. The Steamboat geyser in the Yellowstone National Park is the tallest geyser in the world which can erupt water over a height of 300 feet. Home to more than 350 spectacular waterfalls. Fairy on, Firehole falls, Gibbon falls, and Lewis falls are some of the most beautiful waterfalls in Yellowstone National Park. The park also has rich wildlife. It protects 322 species of birds, 76 species of mammals and 16 species of fishes. It is a group of six stunningly beautiful Islands located in the Phuket province of Thailand. These Islands are famous for their beautiful sandy beaches and spectacular cliffs. The picturesque Maya Bay is the most popular spot of Phi Phi Islands. It is nothing shorter than a paradise with the breathtaking beach with crystal clear blue waters. One hundred meters high cliffs cover the three sides of this bay. ‘The Beach”, the famous Hollywood movie, filmed in the Maya Bay in 1999. After that, Maya Bay become so renowned among international tourists. It is an ideal place for snorkeling and diving. The Ko Phi Phi Don Island has stunning white sand beaches, dramatic cliffs, and top diving spots. The most beautiful part of this Island is a 100-meter long string of sand connects Tanum bay with the Tonsai inlet. It is indeed a great sight to behold. The Bamboo Island of Phi Phi archipelago has the long stretch of white sand and lush, green forest and beautiful coral reef. The bamboo is the central plant of this Island that’s why it named so. There are many cliff jumping spots in Phi Phi Islands. Most of the jumping venues provide proper guidance for the visitors. So that anyone can join in this activity fearlessly. The Ton Sai Tower in Phi Phi Islands is a popular rock climbing spots in the world. The site has around 30 climbing routes. The view from the top is just stunning. More than 50 million years old Namib desert referred to as the oldest desert in the world. The majority of this large desert lies within Namibia. It also covers some regions of Angola and South Africa. The Namib Naukluft National Park that protects the Namib desert is one of the largest conservation areas in the world. Surrounded by the gorgeous red dunes, the Sossusvlei is the most scenic area of this National Park. The surreal looking ‘Deadvlei’ is the most famous part of Sossusvlei. It is a white clay pan from which charcoal-black colored trees stand. 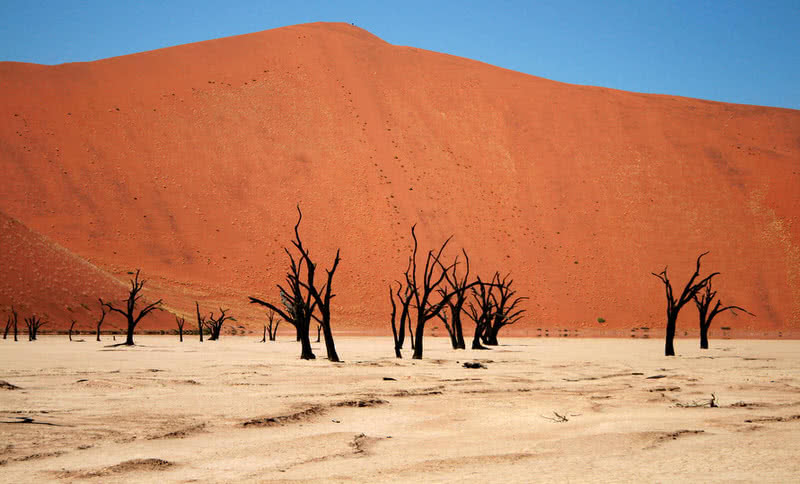 Deadvlei surrounded by the highest dunes in the world, rise to a height between 300-400 meters. The meeting of Namib desert with the cold waters of Atlantic ocean will take your breath away. The coastal town of Swakopmund is the best spot to witness this bizarre meeting of a desert with a beach. Namib is the only desert in the world that home to elephants. They are well adapted to live in a harsh, arid region. 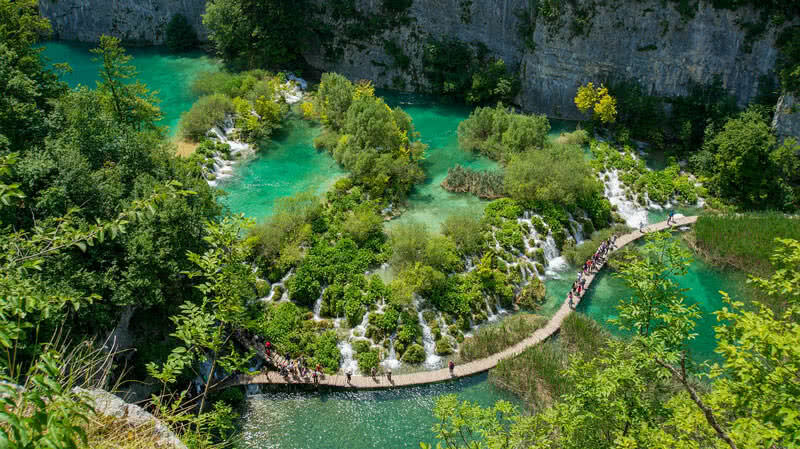 Plitvice National Park is the most popular tourist attraction in Croatia. It is one of the oldest National Park in Europe. The park includes 16 breathtaking lakes that are interconnected by a series of waterfalls. These lakes were formed by the thousands of years of continuous flowing of water over the limestone. The striking turquoise coloration of Plitvice lakes is due to the mixing up of minerals with the water. The Plitvice lakes divided into two different sections. Most of largest lakes of Plitvice are in the upper section, and the small, shallow lakes are in the lower section. The upper part of Plitvice lakes surrounded by lush, green forest. There are well-maintained walking trails that offer a closer view of the artificial lakes of Plitvice. It typically takes 5-6 hours for the completion. Plitvice National Park is also home to rich wildlife including brown bear, wolf, eagle owl, deer and 125 species of birds. A historical region in central Turkey that known for its bizarre geological attraction called fairy chimneys – Cone-like rock formations of different sizes that were formed by solidification of volcanic ash. There are impressive underground cities, dwellings, tunnels, storehouses, and remains of human habitats dating back to 4th Century. Extinct volcanoes bound the Southern and Eastern part of this site. The Christian monasteries in this area are one of the most excellent examples of art by the Byzantine empire. 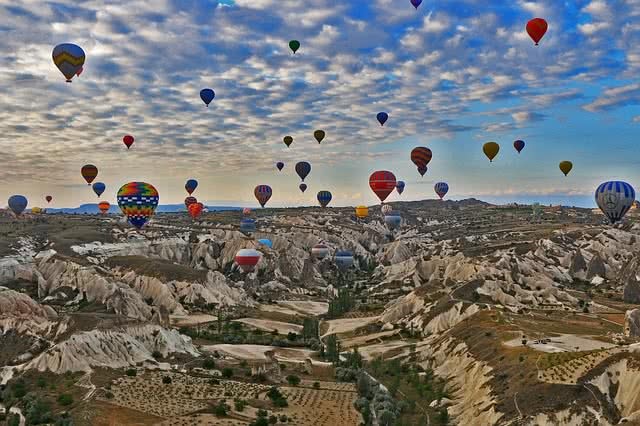 Cappadocia is one of the best destinations for the hot-air balloon ride. It is also the best way to enjoy the beauty of this city. 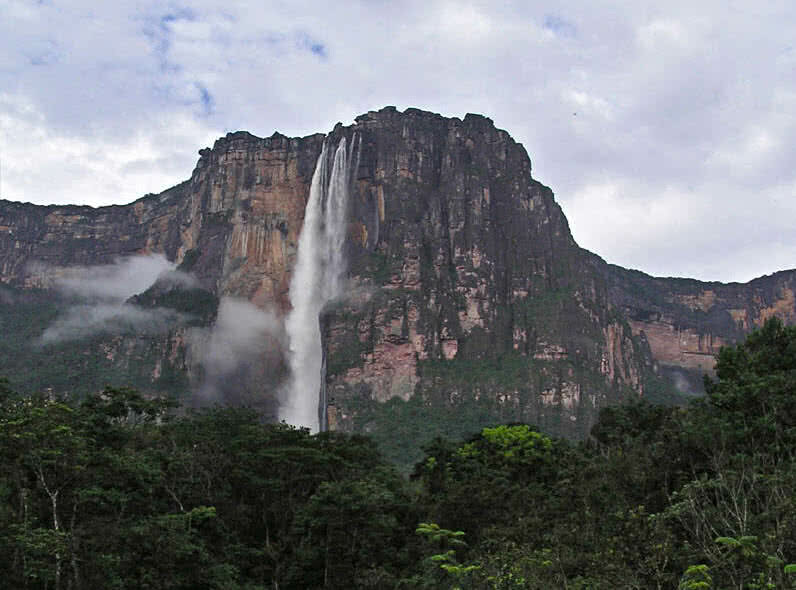 At 3212 feet, The Angel Falls is the highest uninterrupted waterfall in the world. It locates in the Canaima National Park in Southeastern Venezuela. Angel Falls is about 3230 meters above the Venezuelan jungle. Thus, it looks like a crown of the site from far away places. Angel Falls is one of the least accessible attractions in the world as it situates within a dense, vast forest. But you can reach the foothills of this majestic waterfall with the help of local people or take a helicopter flight to enjoy the view from above the waterfall. Named after Jimmy Angel, a US aviator who accidentally discovered this gorgeous waterfall when his plane got crashed at the top of the site. Angel falls can be seen best in the rainy season when it split into two different waterfalls. Visitors can also feel the spraying of this waterfall from a distance of 1 kilometer at that time. In the dry season, the water drop off from the high cliffs of Angel Falls gets evaporate even before it touches the ground. Seychelles is a tropical dream destination located in the East Coast of Africa. This famous archipelago in the Indian Ocean includes many pristine Islands that offers a unique, thrilling experience for the visitors. The Islands of Seychelles have some of most beautiful white sand beaches in the world with crystal clear blue waters. These beaches are perfect for snorkeling, diving, and sailing. It is home to abundant marine life and huge, completely intact corals. 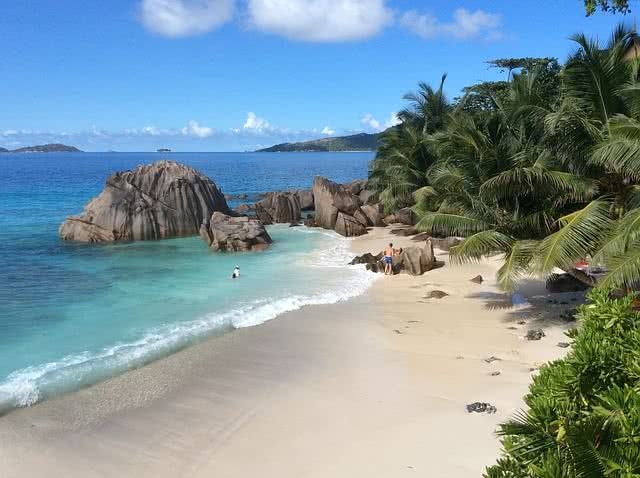 Undoubtedly Seychelles is a paradise for scuba divers. You can swim among thousands of species of beautiful fishes and turtles. Through the clear waters, you will also get a close view of huge, completely intact corals. Seychelles is known for a high standard of living and low crime rate. So that you can enjoy your vacation fearlessly. The forests and coastal routes of Seychelles offer the best hiking and biking opportunities for its visitors. You can hire yachts in Seychelles. A yacht ride in the beaches of Seychelles can be a mesmerizing experience for you. Twelve Apostles is a group of limestone stacks that located on the dramatic coastline of Victoria State. It is a famous highlight of Great Ocean Road. These limestone stacks were formed by erosion over 10-20 million years ago. Once of apostles collapsed back in July 2005. Today only eight apostles remain in the site. 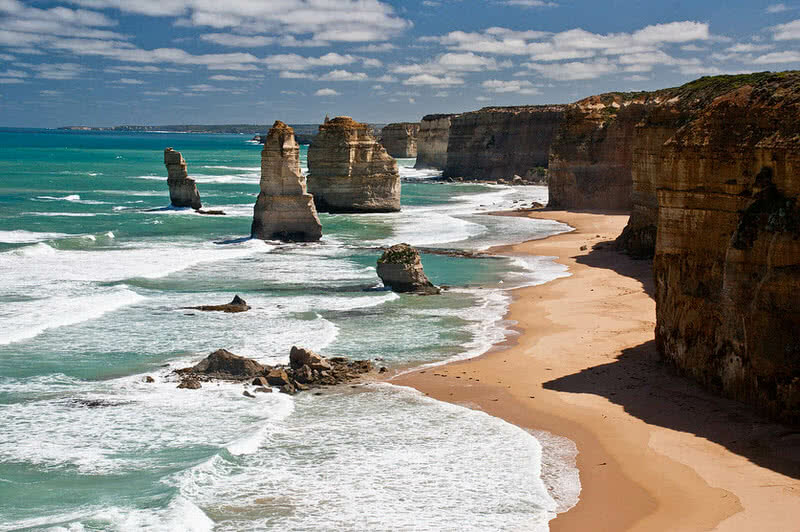 The stunning apostles stand as high as 45 meters in the backdrop of majestic cliffs. Under full Sun, the apostles display brilliant sandy yellow, and at Sunsets and Sunrises, they turn into dark color. You can enjoy a scenic helicopter flight over the twelve apostles. Trolltunga is the most terrifyingly beautiful ledge in the world – A small rock that is jutting horizontally from a cliff. It is situated 700 meters above Ringedalsvatnet lake in Hordaland county of Norway. 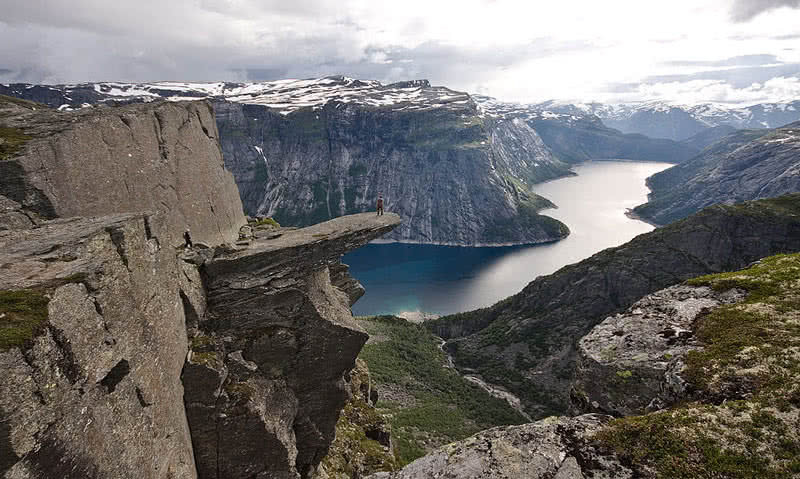 Trolltunga is genuinely one of the most incredible photogenic destinations in the world. The world ‘Trolltunga’ means troll’s tongue in English. Trolltunga hike is one of the things you should do before you die, because of the breathtaking view it offers – fantastic rock formations, lush green vegetation, steep mountains, and gorgeous Ringedalsvatnet lake. You can hike to trolling between mid-June and mid-September. It takes 8-10 hours for the completion. From the top, you can enjoy the view of 1500 meters-tall cliffs, scenic valleys of Hardanger region, green hills, and amazing Ringedalsvatnet lake. Located in the Argentina-Brazil border, The semicircular-shaped Iguazu falls is indeed a watery wonder on Earth. 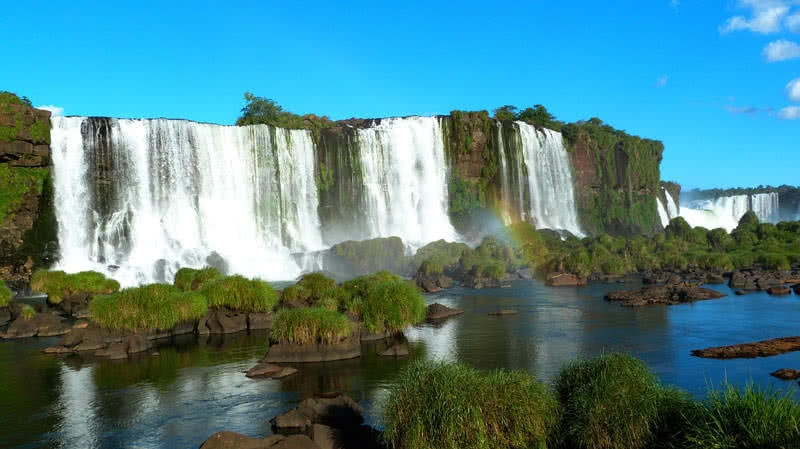 Fed by the Iguazu river, this unbelievable waterfall consist of 275 individual falls. The majority of falls lies within the Argentinian side. This majestic waterfall divides the Iguazu into upper and lower sections. Most of the falls at Iguazu are about 210 foot tall. Some of the falls are also as high as 270 feet. Iguazu falls are taller and broader than Niagara Falls. The well-maintained pathways that built around Iguazu fall offer a splendid view of this amazing waterfall. You can also take a helicopter flight over the Iguazu fall to enjoy its beauty from a different perspective. 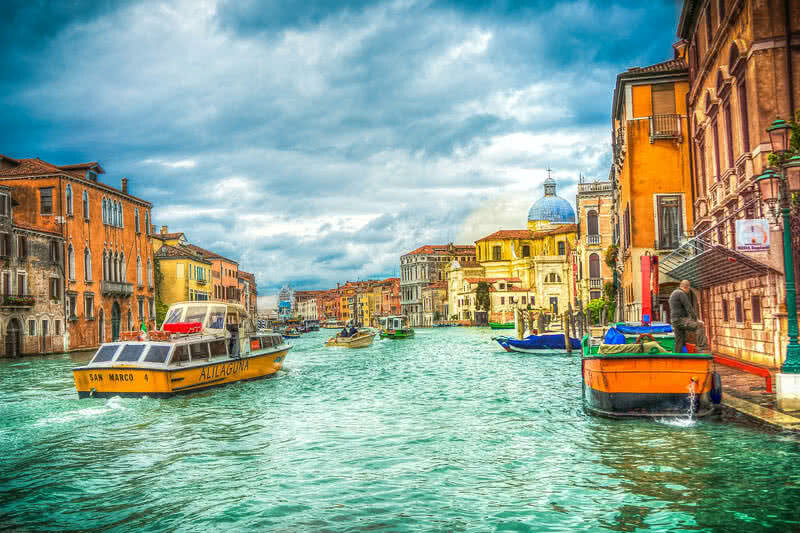 Venice is one of the most picturesque and romantic cities in the world. It situates on a group of 118 Islands. Canals separate the land area of Venice and linked by bridges. Venice is one of the most popular tourist destinations in Europe. Every day the city receives more than 50000 tourists. The gondola ride is a don’t miss activity during your visit to Venice. Gliding through the serene waters of Venetian canals is the most classical way to experience the city. The 3.8 km long, 90 meters wide, Grand canal, is the main section of Venetian waterways. It lined with many important historical buildings of the city. Throughout Venice, you can see many amazing palaces with unique architecture. The Ca’D’Oro, Doge’s palace, Ca’Rezzonico, and Ca’Fozcari are most beautiful palaces of Venice. The Burano village in Venice is one of the most colorful places in the world. You can see multi-colored houses on either side of the canals of this village. The Gallerie dell’Accademia museum in the city has huge collection of 19th Century Venetian arts. 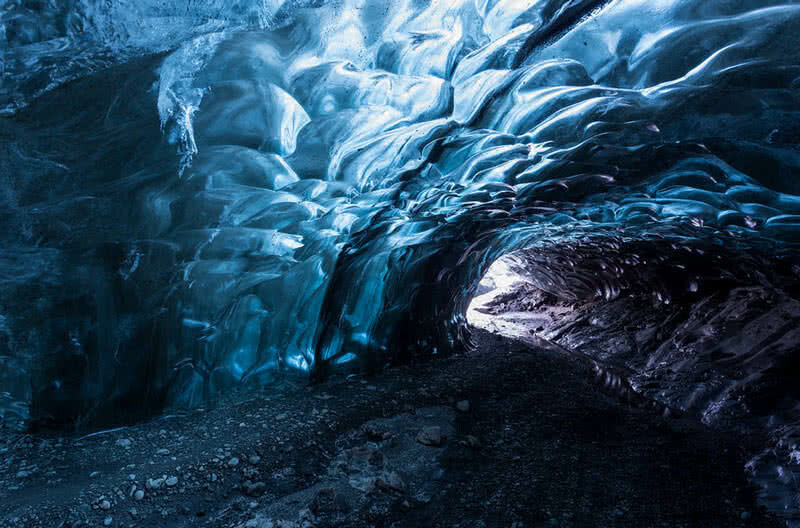 The network of ice caves under the giant Vatnajokull glacier is truly magic of nature. These surrealistic caves are a paradise for photographers and adventure seekers alike. The Ice caves of Vatnajokull are incredibly beautiful and incredibly dangerous. You can only access these caves in winter. In the dry season, ice begins to melt. So it would be so terrible to visit. Even in winter, you shouldn’t visit this site without the help of an expert guide. The icebergs and air bubbles trapped in the ices offers transparency and striking, blue color to these caves. Vatnajokull glacier itself is a mesmerizing attraction. Covering an area of 5500 square miles, It is the largest glacier in Iceland. Glacier walk, mountaineering, ice climb, and trekking are popular tourist activities in this site. It is an incredibly beautiful natural site that contains thermal pools and travertines. It is one of the most popular tourist attractions in Turkey. The word ‘pamukkale’ means ‘cotton castle.’ The mineral forest by which these thermal pools formed truly looks like a cotton castle. That’s why this site named so. Pamukkale is 1.7 miles long and contains 17 hot springs. It used as a thermal spa since 2nd Century B.C. 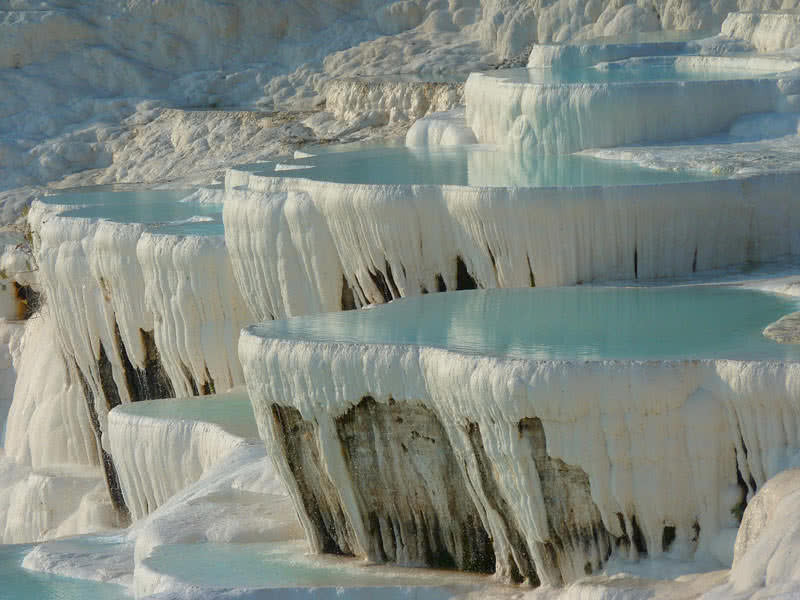 The hot mineral-rich waters of Pamukkale can heal several skin conditions. It is one of the greatest feats of Roman architecture and a famous landmark of the city of Rome. Colosseum was built between A.D 70 and A.D 80 by emperor Vespasian, to stage a fight between gladiators and wild animals. 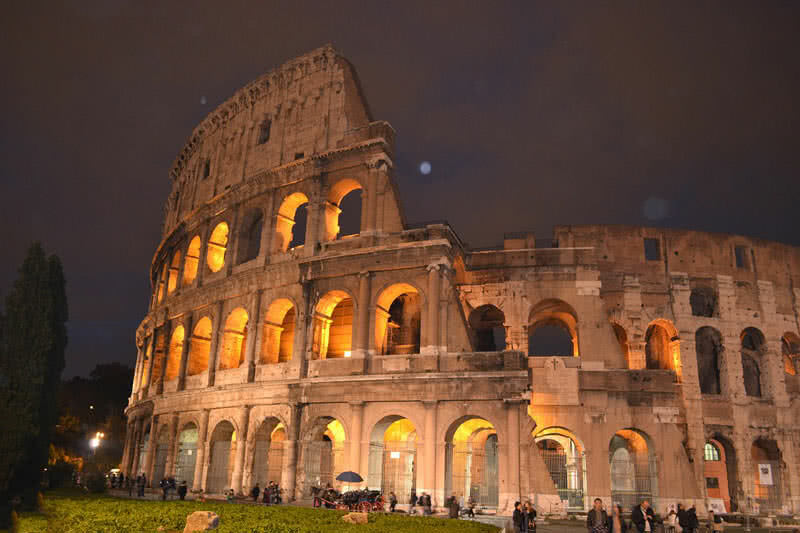 The 485-foot tall colosseum is 156 meters wide and covers an area of 24000 square meters. Originally built as a four-story building that has 80 entrances, 36 trap doors and capacity to hold up to 50000 spectators. There were underground cage and passageways for keeping and transporting wild animals for gladiatorial fights. There was a separate seating arrangement for low-class people, high-class people, and a royal family. Colosseum abandoned in the 5th century with the end of the Roman empire. It was also heavily damaged by the earthquakes of A.D 847 and A.D 1231.